Revolutionary statesman. Prominent in resistance to British rule and the creation of independent N.C. Home was 1/4 mi. 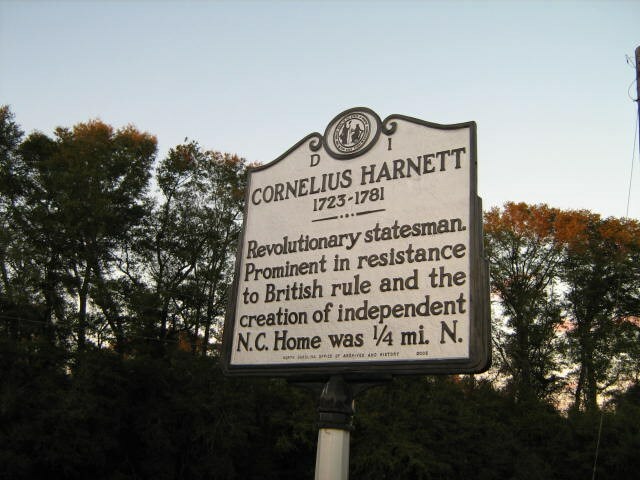 N.
Cornelius Harnett, statesman and organizer, was a leading voice for an independent North Carolina during the Revolutionary War. Through stalwart guidance after the war, he also oversaw the transformation of an independent North Carolina from province to statehood. Born to an Irish immigrant family in Chowan County in 1723, young Harnett and family moved to Brunswick in 1725 to escape repercussions of his father’s participation in an Edenton riot. In his early adulthood, Harnett distinguished himself as an able merchant, operating wharfs and distilleries in the Cape Fear area. After making a name for himself in business, Harnett ventured into politics when elected to the Wilmington town commission in 1750. As in his business pursuits, Harnett built a solid reputation as a steadfast politician through a series of public offices, which culminated in his election in 1754 to represent Wilmington in the General Assembly. The turning point in Harnett’s career was in 1765, when the provincial government introduced the Stamp Act. In leading opposition against the act, Harnett became an advocate for states’ rights and an activist for independence from Britain. Already a respected North Carolina statesman, Harnett became active in the struggle for North Carolina’s independence. Soon after the introduction of the Stamp Act, he and fellow patriot John Ashe led a protest against British tyranny through the streets of Brunswick. Not long after, Harnett was elected chairman of the Sons of Liberty’s Wilmington chapter. At the Fourth Provincial Congress in Halifax, Harnett chaired the committee that, in April of 1776, produced the Halifax Resolves, a formal declaration of North Carolina’s support for independence from Britain. He, along with Ashe, was instrumental in drafting North Carolina’s first state constitution in autumn of that same year. 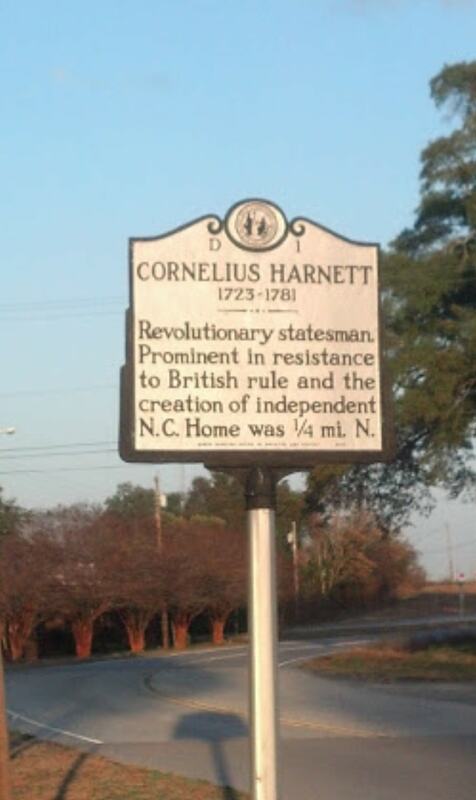 In his twilight years, Harnett represented North Carolina in the Continental Congress, 1777-1780. Harnett was captured during a British raid of Wilmington in 1781. His health having deteriorated while imprisoned in a British holding cell, Harnett died soon after his release later that year. For his vision and dedication during the Revolutionary War, Harnett County (est. 1855) is named in his honor.